Stepping behind the camera for the thirty-eighth time, as well as in front for the sixty-third, the line might well have been written with Eastwood in mind. Six decades into his career, his name still commands awe and respect and unlike his contemporaries, it is not because of what he has done but because of what he continues to do. 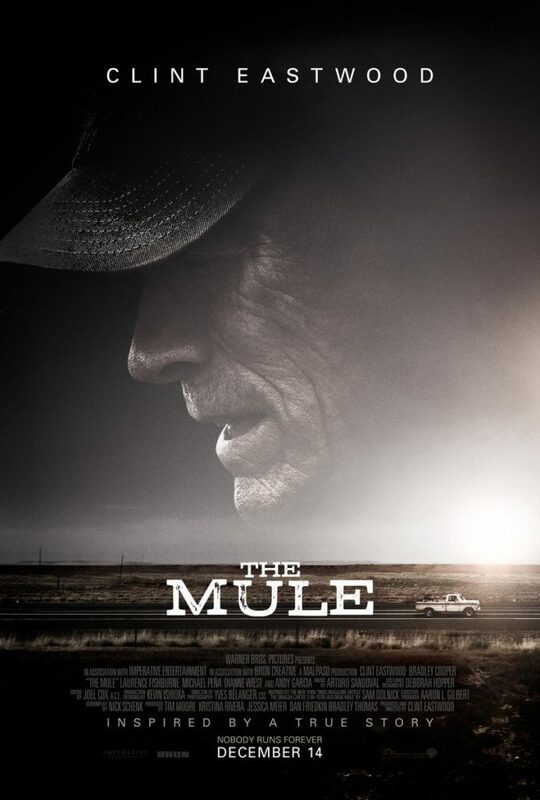 The Mule is a beautifully made road movie devoid of ego where Eastwood shows every line on his face (and arms) – a softer version of his openly racist character in Gran Torino. here his character, Earl, is still – for all his charm – too quick to put his needs above all others; a selfish, thoughtless man who, thanks to Eastwood’s mischievous charisma, you can see why his family still don’t want to fully cast him aside. As entertaining as the film is, it doesn’t seem to know quite what it wants to be: it’s laid back and funny – an exchange with Andy Garcia’s cartel kingpin a particular highlight – but at the same time it serves as an odd mix of therapeutic confession as Eastwood tells Bradley Cooper’s DEA agent that he regrets putting work above family and Eastwood’s real-life daughter, one of at least eight children from numerous women, shares the screen with him just to add to the poignancy of his words. We never get to see the stark reality of the job Earl is doing the while, yes, it’s fun to see the 88-year-old star casually eating ice cream while his cartel handlers freak out, the movie overlooks the ultimate destination of his cargo and the pain and suffering that Earl is blissfully delivering. What it is though, is a charming, funny and at times tense movie that puts the story over spectacle. In that regard, Clint Eastwood remains forever the outlaw.